IP30 - For unmatched data collection! The Intermec IP30 add-on handle for passive UHF RFID is the leader in handheld RFID readers. 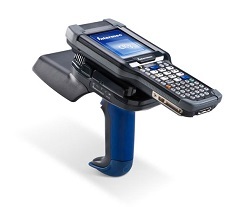 The modularity of the IP30, when combined with the RFID-readiness of Intermec mobile computers, transforms the mobile computer into a handheld RFID reader in a snap.